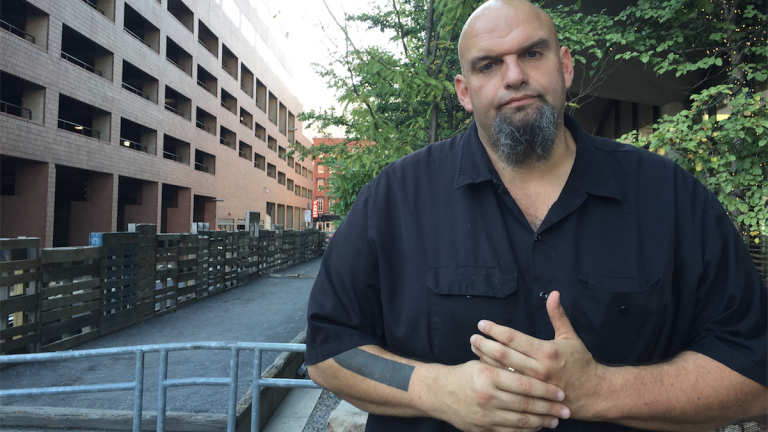 John Fetterman, the goateed, tattooed, 6-foot-8 mayor of Braddock, Pennsylvania, has launched the first TV ad of his nascent campaign for U.S. Senate. The beautifully produced 60-second spot ran twice last night on CNN before and during the Democratic presidential debate on Western Pennsylvania TV stations, a Fetterman spokeswoman said. The ad reflects the heart of Fetterman’s message — that he took on the challenge of reviving an impoverished former steel town and made a difference. “We’ve taken on a degree of challenges here unmatched by any community in Pennsylvania,” Fetterman says in a voiceover of scenes from the town, including him unloading boxes of food. “We feed people every day here. We help clothe families — practical things that matter to people,” he says. Fetterman won’t be on the ballot until the spring, when he’ll face former Congressman Joe Sestak and Gov. Tom Wolf’s former chief of staff, Katie McGinty, in the Democratic primary. The ad wasn’t shown enough to boost Fetterman’s name recognition much. It was clearly intended to engage active Democrats tuned into the debate, generating donations and buzz. Fetterman reported raising $170,000 between his Sept. 14 announcement and a Sept. 30 campaign finance deadline.